There’s good news for those out there with clients who like to plan their winter vacation early as Sunwing has announced it’s bringing back its popular Price Drop Guarantee promotion. The upshot here is that Canadians who book by July 4 can look forward to securing their next tropical getaway with the knowledge that they’ll be guaranteed up to $400 back off their winter vacation should the price drop closer to their departure date. What’s more, travellers can also look forward to taking their travel budget even further with a reduced deposit of $100 (per person) and a travel voucher of $50 (per person) towards their next vacation. 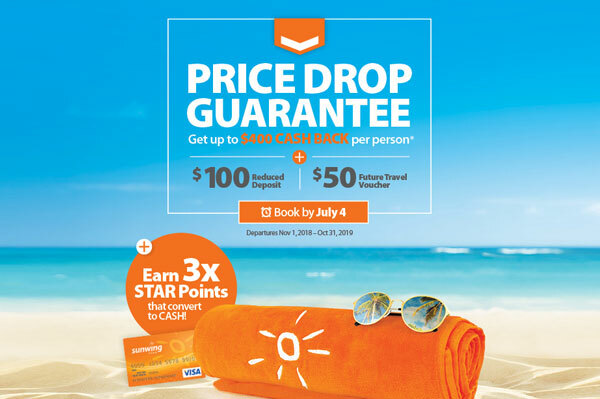 Plus Sunwing hasn’t forgotten its agency partners because during this promotional period, agents are eligible for 3X STAR Agent Reward points on each booking made between now and July 4. For more, go to www.sunwing.ca .